Another example of AIS radar displayed on Google maps using an RTL-SDR, SDRSharp and ShipPlotter is shown by YouTube user Superphish. To set up an AIS ship radar on a windows system you will need four things. A vertically polarized antenna tuned to 162MHz. Software for decoding the AIS signals. We will assume you have the RTL-SDR dongle set up and working already. If you have not bought a dongle yet, see the Buy RTL-SDR page for information, and the check out the Quickstart Guide for an easy setup routine with SDRSharp. You will also need to have an audio piping method installed and set up. Audio piping will allow the audio from SDRSharp to be passed to a decoding program. You can use either windows stereo mix, VB-cable (free) or virtual audio cable (paid with trial version). AIS signals are broadcast at both 161.975 MHz and 162.025 MHz and have a maximum range of approximately 75 kilometers. So if your radio set up is more than 75 kilometers away from any boats, you will probably not be able to receive AIS signals. AIS is also considered a line of sight signal, meaning that if there are large buildings or mountains in the way of your antenna and the boats, AIS signals could be blocked. Because of this reason it is important to put your antenna as high up as possible. There are multiple commercial AIS antennas designed for marine use that will work. However, sometimes home made antennas work even better and they of course are cheaper. Some home made AIS antennas are shown below. A simple 1/4 wave groundplane antenna will suffice especially if you can get it up high and outside. The antenna consists of one vertical 1/4 wave element connected to the center of the coax cable and four or more grounding elements pointing towards the ground at 45 degree angles which are connected to the coax shield. A good way to calculate the exact element lengths required for 162 MHz is to use the calculator available here. Similar performance can be obtained with a dipole antenna which is just two quarter wave elements pointing away from one another, with the coax connected in the center. One element is connected to the center pin, and the other is connected to the coax shield. A good antenna for AIS is the coax collinear antenna. The collinear antenna has very high omnidirectional gain directed towards the horizon. This means it will receive signals best from sources that are near the horizon, which is where ships will be. A collinear coax antenna is basically a length of multiple short coax cables, where the coax outer conductor is connected to the inner conductor in an alternating fashion. As it is made out of coax cable almost entirely, it is a very cheap antenna to build. 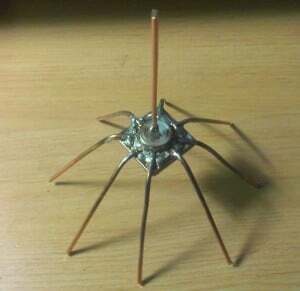 On this page there is excellent instructions on constructing a few versions of a high gain coax colinear AIS antenna. If the majority of ships in your area are focused in one direction only, a high gain Yagi antenna may be a good choice. A Yagi is a very directional antenna, meaning that it will only pick up signals in the direction it is pointed. The advantage is that with directionality we can get a very large signal gain, which allows reception of further and weaker signals. Building a Yagi is definitely a tougher job compared to the building a coax collinear antenna, but it is much more compact and can have a similar gain to a coax collinear. 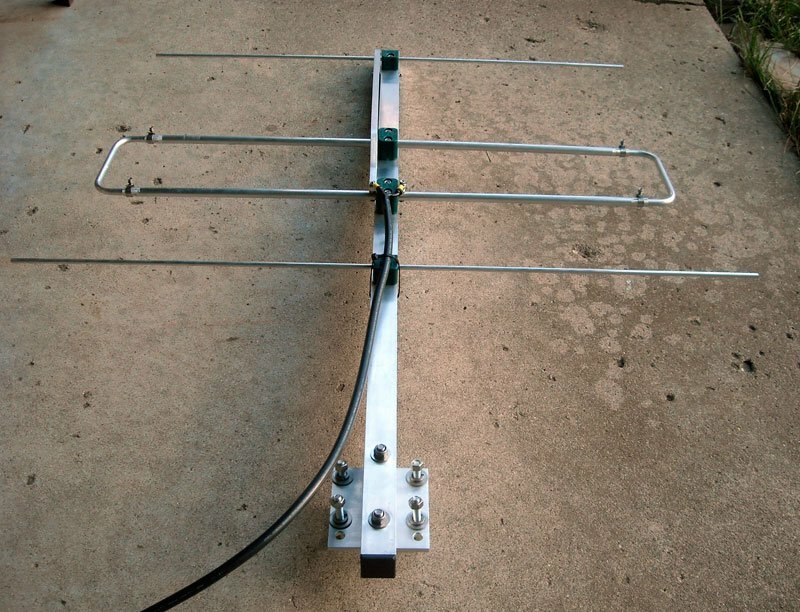 One page on a homemade AIS Yagi’ can be found here and another here. A commercial AIS Yagi can be bought from here and a review of this antenna can be found from here. The slim-jim is another high gain antenna that is reported to work well with AIS. A slim-jim antenna can be easily made on a budget using common 300 Ohm twin lead ribbon cable. A page showing a twin lead slim-jim is here, but that version is designed for 145 MHz. To calculate the correct lengths for AIS, this calculator can be used by inputting 162 Mhz into the frequency box. An image showing a slim-jim with AIS dimensions is here. First, use SDR# to tune to an AIS signal and confirm reception. Open SDRSharp, set your audio piping method in the Audio output drop down box, and tune to an AIS frequency (161.975 MHz or 162.025 MHz). In SDR#, the signals may not appear exactly on the AIS frequencies, since the RTL-SDR is not frequency accurate (unless you have a RTL-SDR with TCXO). Just tune manually until the signals are properly centered, or set the PPM offset correctly. Play with the RF gain in the SDR# configure button until you get good reception of the AIS signals. You want to adjust the RF gain such that the signal is strong, but the noise floor is low. Take note of the optimal gain setting for later. Set the receive mode to NFM, bandwidth to 12.5 kHz, Filter Audio to OFF and squelch to OFF. Be double sure that you have set Filter Audio to OFF or this will cause bad or no decodes. The two AIS frequencies broadcast the same information (but at different times) and are used in commercial AIS receivers for redundancy and to help avoid transmission collisions. Some AIS decoder software written for the RTL-SDR such as AISdeco2 can monitor both channels at once, but most others cannot. Once you have AIS reception set up you can then use a program for decoding. There are three decoders that we recommend. The most recommended decoder is the free AISdeco2. It is command line based, but can connect directly to the RTL-SDR and can monitor both AIS channels simultaneously. AISMon is another alternative free program, but is a little more clunky to use even though it has a GUI, as you must pipe audio from a program like SDR#. Both AISdeco2 and AISMon require the use of a third program such as OpenCPN to visualise the ship data on a map. ShipPlotter is another option that includes decoder and mapping, but is a commercial program with a 21-day trial. Currently the software we most recommend is AISdeco2 which is available for Windows, Linux and the Raspberry Pi. It can be downloaded from xdeco.org. AISdeco2 directly connects to the RTL-SDR (requires no audio piping) and can listen to both AIS channels simultaneously. To use AISdeco2 on Windows follow these instructions. First ensure that you have accurately determined your dongle’s PPM offset using SDR# or another program (unless you are using a TCXO dongle). Also use SDR# to determine the optimum gain setting for maximum SNR. Once the PPM offset and optimum gain is recorded, close SDR#. Download the correct version of AISdeco2 for your OS from xdeco.org and extract the zip file into a folder on your PC. In the extracted folder use Notepad to open aisdeco2.bat. In this file set the value after the –freq-correction flag for your RTL-SDR dongles PPM offset value. Also set the –gain value to the optimal gain that you found when receiving AIS signals in SDR# or similar software. Save your changes and close Notepad. Now double click the aisdeco2.bat file to start the command line software. Decoding will begin automatically. Now to display the data on a map scroll down to the “Display AISDeco2 or AISMon data on a map” heading which will explain how to map the data on OpenCPN. AISMon is a free AIS decoding program which can be used to decode one AIS channel. It is an alternative to using AISdeco2 which is the recommended software. AISMon can be downloaded from the AISMon Yahoo group files section. You may need to first join this group using a Yahoo account to access the files section. The Yahoo group also contains a sample AIS .wav file, which when used with stereo mix, can be used to test both AISMon and ShipPlotter. AISMon does not connect directly to the RTL-SDR and so requires you to pipe the audio from your radio receiver software like SDR#. Open AISMon, set the audio piping device to the one you have chosen, and set the sampling rate to 48000. Press start monitoring. 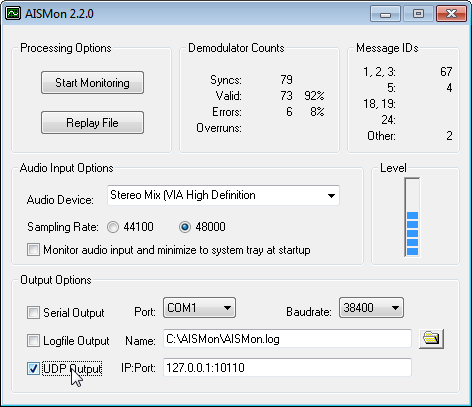 Tune to your AIS signal and adjust the volume in SDRSharp, and/or the Windows volume settings until the Level meter in AISMon reads at about halfway. If everything is working you should begin to see numbers appear in the Demodulator Counts section of AISMon. 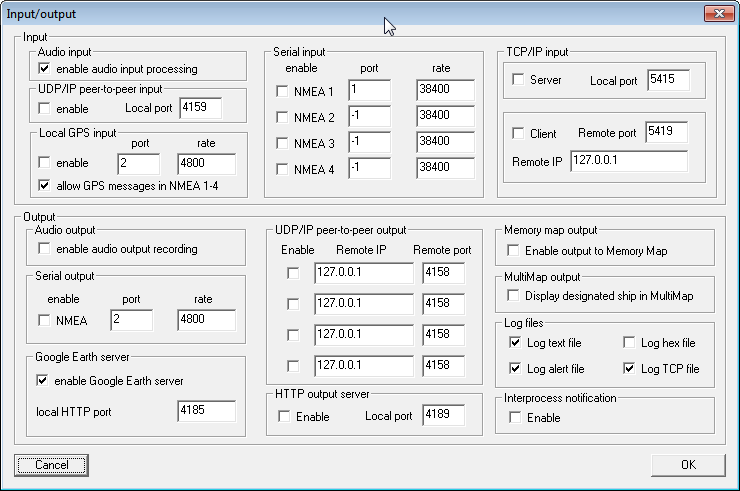 To output data to a mapping program (explained below), check UDP Output, and enter 127.0.0.1:10110 into the IP:Port box. (You will need to stop monitoring first if monitoring is still running). By itself, AISDeco2 and AISMon do not display any ship information on a map. To view ship information you will need another free opensource program called OpenCPN, which is a chart plotting and navigation program. OpenCPN can read the “NMEA” information that is output by AISdeco2/AISMon, and plot the ship positions on a map. Download and install OpenCPN from here. Click on the Options button (looks like a wrench) in OpenCPN, and go to the Connections tab. Under Data Connections, click on Add Connection, and add a Network UDP connection, with address 127.0.0.1, and port 4159 is using AISDeco2 or 10110 if using AISMon. Click Apply and OK. If everything has been set up correctly, ships will begin to appear in the OpenCPN map. If you want more accurate maps or charts you will need to follow the instructions on the OpenCPN website for downloading charts for your particular location. Another possible method for displaying AISMon data is to share your UDP data to the marinetraffic.com website, and view the ships on their shared map. You can do this by simply using the marinetraffic.com IP address to send the UDP traffic to. Instructions are here. Note, be careful that you do not send delayed AIS data to marinetraffic.com, such as with the sample AIS file from the AISMon Yahoo group. ShipPlotter is another alternative to AISdeco2 and AISMon. 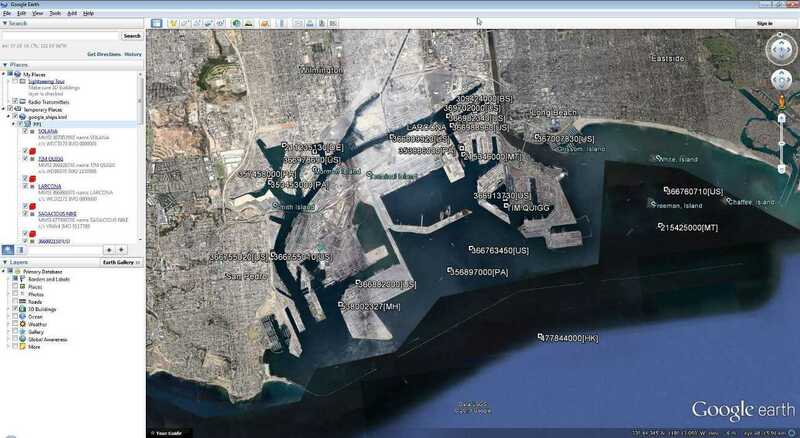 It is a software tool that can decode and also plot the location data stored in AIS signals. ShipPlotter is commercial software and costs 25 euros for personal use, but has a 21-day trial. 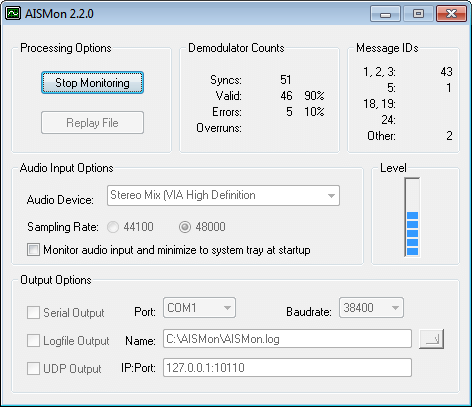 ShipPlotter does not connect directly to the RTL-SDR and so requires you to pipe the audio from your radio receiver software like SDR#. Instructions on using ShipPlotter are shown below. Download and install ShipPlotter from their website here. Open ShipPlotter. Go to Options -> Audio -> SoundCard and select your audio piping method. Under Options -> I/O Settings, ensure that enable audio input processing is checked. 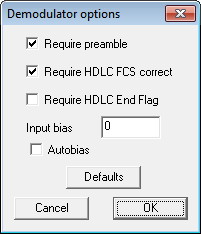 Ensure the Demodulator options in Options -> Demodulator are set to the default values, with ‘Require Preamble’ and ‘Require HDLC FCS correct’ both checked. Tune to your AIS signal and push the green ‘Start’ button and then click on the ‘Raw’ icon which looks like a horizontal line with a squiggle (sine wave) going through it. This will show a waveform of the input audio. Ensure the audio levels are adequate and not clipping, by making sure the waveform peaks at about halfway on the graph by adjusting the volume settings in SDRSharp, or the windows volume settings. Now you should be able to click on the ‘Ships’ and ‘Messages’ icons to see the decoded AIS information. To see ships visually, you will need to follow the ShipPlotter instructions for downloading charts. An easier method than downloading charts is to display the ships in Google Earth. To get ShipPlotter to work with Google Earth, you must first enable the Google Earth server in Options->I/O Settings. The HTTP port can be left as default. Then you can go to the folder ShipPlotter was installed to (most likely in ‘Program Files (x86)/COAA/ShipPlotter’), and open the google_ships.kml file in Google Earth, to see the ships. Note that you will need to open ShipPlotter and begin decoding AIS signals by pressing the green button first BEFORE opening the google_ships.kml file, otherwise ships will not show up. AISdeco2 is the currently recommended software to use in Linux and the tutorial is similar to the Windows one shown above. You may need to play with the bandwidth setting if using SDR# to pipe the AIS audio if your signals are weak in order to get a good decode. Just ensure the bandwidth covers the signal width adequately. A low noise amplifier (LNA) such as this one may help you to pick up weak AIS signals better. Make sure you are using a good antenna tuned to the AIS frequency of ~162 MHz for optimal reception. Antenna height is important, the higher and more unobstructed the better. AIS signals can be easily obstructed by buildings and objects such as trees. You can test AIS decoding without an antenna using the example AIS .wav file in the AISMon Yahoo groups files section. Just use stereo mix as the audio piping method and play the audio in any audio player on your computer. If you enjoyed this tutorial you may like our book available on Amazon. Available in eBook and physical copy formats. can anyone record AIS signal with raw IQ format and upload it for download? i need it but i am not in sea side that i can record by myself. Aisdeco2 download does not have the batch file in it? Tried creating one but I’m running into a bunch of errors: after I mirror the setup I have when using another PC I get the error freq-correction cannot be specified twice? When i delete both AIS freq specifications from the code it also shows PLL not locked. Any suggestions? What a perfect manual. Thanks a lot!. If so, you should install on the computer a virtual audio cable e.g. VB virtual audio cable. Aismon to receive audio signal from this same audio cable. The system works without any audible signal. Só é possível utilizar online, sem internet não dá. Look for our new Navigational Decision Support System – NAVDEC. New posibilites and functions. I tryed to install kalibrate-rtl on Linux as described in the book “The Hobbyist’s Guide to the RTL-SDR”. I got errors and find a solution for the errors. I would like to inform the auther Carl Laufer about the missing command to install kalibrate-rtl under Linux. But i was unable to find an email addresse of Carl Laufer. Can Carl Laufer contact me?? We’d be very pleased if anyone wants to share AIS data into our network too – it will be used to show ships in our Boat Beacon app for iPhone or Android – we let small boat users see AIS ship positions on their phones, and add crash avoidance, etc. – we have details on how to connect to us here: or contact me and I’ll setup a custom UDP port so you can monitor your own traffic. Can’t get ShipPlotter to show the CABLE input, only the inputs to my other 2 soundcards. so I’m stuck on step one. It’s working in AISMon and SDR# just fine, but I can’t choose something that doesn’t show up on the list. Any idea why when I pick “Other (Sound Card)” in SDRSharp, I can only tune to 24Khz? no higher? Thanks for the tutorial. Install of all SW went fine on two different computers, inclusive a small ACER Aspire One (1.6 GHz, 1GB RAM) under Win7 Dongle is the Nooelec R820T SDR&DVB-T NESDR Mini. Now I just need to go in a region where there are some AIS signals to listen to… In Switzerland we are too far away from the Sea to receive something:-) This is planned for in a couple of days. I could teset tes system with real signal. Worked very well! Only detail, I needed to connect to a network (WiFi or Cable) just to have the UPD packets forwarded between AISMON and OpenCPN… Strange behavior of the network under Win7, this should not be necessary in an ideal world. First: Thank you very much for the tutorial. Then: I have a problem with the Aismon program. I’m using Aismon to send Ais signals already decoded to OpenCpn. It works (OpenCpn shows boats) only if the computer is connected to Internet. If the computer is not connected to the Internet, the box of the Aismon Ip:Port selection blink red and OpenCpn shows no boats. Hi, I didn’t realize this before, but I think there is a limitation of Windows. It seems you can get around it by installing the Microsoft Loopback Adapter – Instructions here: http://technet.microsoft.com/en-us/library/cc708341(v=ws.10). I just tried it and it seemed to work. Alternatively, you could try using a “Virtual Serial Port” program, and using the serial output in AISMon, and serial input in OpenCPN, but I never found a free virtual serial port program that worked on Windows 7. Try http://www.eterlogic.com/Products.VSPE.html. Alas, this software has not been updated for a long time. Since Windows 10 is also a new platform and virtual com ports can be created using the http://www.serial-splitter.com/. This must be kHz instead of MHz. Hi, yes my mistake, thanks for the correction. I have been playing with ADSBSharp in the NYC area and came across this article as I wanted to see if there was an AIS equivalent. I live near the water so I there is plenty of marine traffic to monitor. I was hoping there would be something called AISSharp but these instructions are doable. Maybe I’ll take a stab at the ADSBSharp code someday and see if it can be massaged into handling AIS. An ‘AISSharp’ program would be great. It would still help to have a waterfall display though, as the frequency error of the dongle can make it difficult to get exact tuning, and also AIS is sometimes near interfering pager signals requiring careful visual tuning of the gain. If you know Linux well, gr-ais might also be worth looking into. I agree! ‘AISSharp’ would be a great thing! A missing peace in the field right now. Aismon do exist but it’s designed only for decoding and I think is only one channel. Maybe possible to have a automatic calibration. The frequency error is definitely an issue. I used Kalibrate to analyze my dongle and it comes in with a 22ppm error. After applying a 22ppm correction I get an error of around 200Hz. I started digging around a bit in the ADSBSharp code. Ouch! I am very impressed at the work. Besides the “trivial” task of removing the ADS-B decoding routines and replacing them with AIS code, the easiest part IMHO would be swapping port 47806 for port 5414 which AISMon could then connect to instead of using the audio port. I really need to look at AISMon to see what its data requirements are on port 5414. So many ideas, so much other job related work that has to be done! 22ppm is pretty good. Most of mine are around 50+ ppm off. Something i’m confused about, why would you need to connect to AISMon if you are going to be doing the AIS decoding in the C# code? It may be confusion on my part but it appeared to me that AISMon accepts a TCP/IP feed just like VirtualRadar does. Maybe I am wrong on that interpretation but I thought that it could process RAW data fed to it from another program instead of using an audio stream.